According to Alcoholics Anonymous, admitting you have a problem is the first step toward change. Political leaders at both the federal and state level can stand to learn from this philosophy, given their refusal to acknowledge massive boondoggles bilking taxpayers for billions of dollars. California, and the proposed Texas Central high speed train, show why state and federal officials need to be more vigilant and cautious when spending taxpayer money on these projects. California’s disastrous bullet train project has ballooned to a staggering $88 billion dollars - four times the cost of taxpayer money available to finance it. On March 26, California added even more fuel to the fire, selling $600 million worth of bonds to further finance the failed project. Despite protests by some that the show must go on, the Trump administration is considering withdrawing billions of dollars in available funds slated for the bullet train’s construction. But reclaiming this money for taxpayers will all be for naught, if the federal government continues to throw money at other failing projects nationwide that manage to stay below the public radar. Drawing a line in the sand is important, but consistency is key to protecting taxpayers from government run amok. 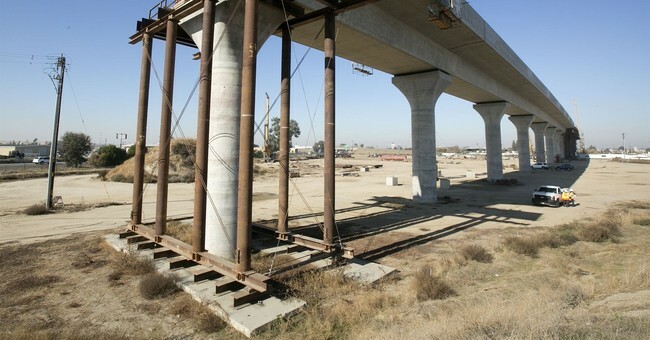 Washington’s disastrous dalliance with the California bullet train began in the Obama administration, when the federal government awarded $3.5 billion to the state for the construction of a train line connecting San Francisco to Los Angeles. Politicians used comparisons to China, Japan, and Germany’s rail experiences, insinuating that a 220-mile-per-hour train connecting two major cities could be a panacea for America’s transportation woes. But from the start, “flawed decision making and poor contract management” hampered the construction process. According to a report written by the California State Auditor, “poor communication between...consultants and the Authority meant that the Authority’s contract managers were uncertain whether invoices that the RDP consultants approved were for appropriate services and whether contractor work products were reasonable based on their costs.” Nonetheless, the Authority began construction before even having agreements in place with utility companies, resulting in utilities being unable to relocate their activities in time to meet project deadlines. And time is money, since any delay means workers need to be on the job - and be paid - for a longer period of time. And now President Trump is trying to pull the plug. The president wants the Golden State to pay the federal government back for the $2.5 billion it already wasted, and cancel an additional $1 billion that Congress approved for the project but the state has yet to spend. Legally, the next step is tricky. It’ll be far easier for the administration to get back the nearly $1 billion that lies in limbo, and the president will be on far firmer ground if he works with Congress to recover those funds. But over the long-run, the administration and Congress can help taxpayers the most by reducing the risk of transportation boondoggles across the country requiring taxpayer bailouts. The proposed Texas Central high-speed train line connecting Houston and Dallas will supposedly be funded without any contribution from taxpayers, but early farebox estimates do not seem to add up. If history is any guide, Texas Central will be looking for a taxpayer bailout. As Reason Foundation scholar Baruch Feigenbaum notes, the low population densities of Houston and Dallas, coupled with high land acquisition costs, make it unlikely that the project will be able to pay for itself without significant taxpayer expenditures. Even using conservative assumptions, Feigenbaum finds that Texas Central will be more than $20 billion in debt over the next forty years. And since the federal government has a disturbing history of financing over-budget boondoggles, it wouldn’t be surprising if they jumped into the fray. Federal planners should keep the flow of funds limited to the precious few projects that actually accommodate more residents. Safeguards against lawmakers trying to steer funds to their own backyards must also be put in place. Until political leaders accept that the current system is deeply dysfunctional, taxpayers will continue to foot the bill for failed expectations.